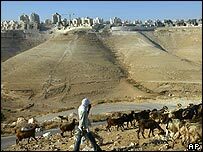 The UN has condemned Israeli settlement building in Palestinian territories and called for the policy to be reversed. The resolution at the annual Human Rights Commission meeting in Geneva was passed easily with only the United States and Australia voting against. Two other resolutions were also passed, calling for Israel to withdraw from the Golan and condemning its use of force. Correspondents say the censure brings no penalties but it highlights the Israeli government's record. Delegations lobby hard to avoid resolutions against them. confiscating Jewish settlers' weapons to prevent acts of violence by them. It was passed by a margin of 39-2 with 12 nations, including Britain, Canada and Germany, abstaining. Israeli ambassador Itzhak Levanon, who has no vote on the forum, rejected the resolutions as "one-sided" for singling out Israel and not condemning violence by Palestinian militants. Condemning settlements created a "disincentive for Palestinians to move on in implementing a first phase of the road map on stopping terrorism," he said. Mr Levanon said the issue should be left to bilateral negotiations on a final resolution as agreed in past peace accords. Muhammad Abu-Koash for the Palestinians said listening to Mr Levanon, one could imagine that "Palestinians are the occupiers and the Israelis are the occupied". "I urge all members ... to judge Israel by what it does and not by what it talks," Mr Abu-Koash told delegates. About 400,000 Jewish settlers live in Gaza and the West Bank, including East Jerusalem - alongside more than four million Palestinians. Israel captured the land in 1967 and has occupied it since then. The international community considers all settlements in Gaza and the West Bank, including East Jerusalem, as illegal under international law, though Israel disputes this. Last April, President George W Bush broke with previous US policy by saying that a permanent peace deal would have to reflect "demographic realities" regarding Israel's settlements in the West Bank. Israel is planning to unilaterally pull all 8,000 Jewish settlers, and the Israeli troops who protect them, from Gaza this summer. But it will keep control of the borders, coast and airspace of the occupied territory, which is home to 1.5 million Palestinians. Four isolated settlements in the Israeli-occupied West Bank will also be evacuated.